It's been a while since I have been back on this site. I thought I would share a couple of things with you pertaining to the Trevor Morgan lines and what I have been doing with them in the time I have been absent for this thread at least. The longest heaviest rod I own (for the moment) is a 15' 10/11 wt. that I have a Trevor Morgan floating spey line on. In years past during the Fall Walleye run here, I got them on the bottom and close to shore, at least relatively speaking. This last Fall was a different story altogether. The fish were neither on the bottom nor anywhere near shore. I have two 15' spey rods. One is a Meiser. It is such a great rod I keep telling people I want to be buried with it. I have an AirFlo Delta spey line on it. My other is an Albright 15' 10/11 wt I got on a closeout deal from Albright direct for about $85.oo American dollars. I spent more than that on a date a while back and all I got was a peck on the cheek. Trust me the Meiser is a far better rod. But this Fall the Walleye were so far out that first of all, the Airflo line was to short to get to them, (I have added 30' of running line now) but it doesn't cast as well as the Trevor Morgan line. For those of you who have never heard what I'm doing with Walleye, I have been working on getting every last Walleye record with a fly rod. I think I can do it. I live in the best place you can think of to do it, and I have the scaley *******s figured out. I broke two records this Fall, both with the Trevor Morgan line. Both were hooked well out past 100'. Where I was fishing was by a bridge made with 30' sections. It's easy to tell how far you cast there. I was doing casts past 140' with a Trevor Morgan line and an Albright 15' 10/11 wt. rod. Most of the fish this Fall came from at least 100' out. Trevor Morgan did not ask me to say this. He didn't pay me, or bribe me in any way. This is as I have said before a strictly self interested endorsement. I want these lines to be around in the future. I can hit 140' consistantly, and that's measured with 30' bridge sections, not a guess, on a rod that never got the respect I think it deserves. I am not trying to bash the rod, but this is a lot the line. I love the line. Do me a favor and next time you go try and buy a line, look at the Trevor Morgan lines first. I don't ask this for Trevor Morgan but for me because if I ever manage to kill one of my lines, I want to be able to replace it with another Trevor Morgan line. 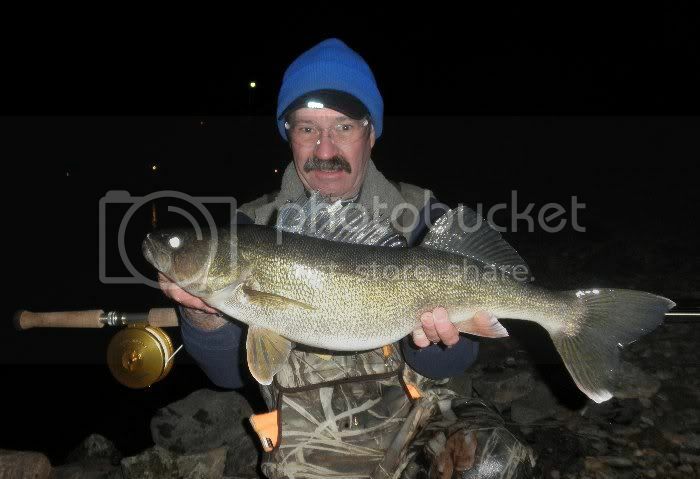 Here is the Fresh Water Fishing Hall of Fame 14lb tippet record Walleye. One of two records I got this last Fall on Trevor Morgan's lines. Please don't make me look for a different line one day. Note the white head coming out of the reel. Trevor Morgan line. I was thinking about these lines and how long I have had them for. This is the fourth season I have been using them. I have used them in weather where it was 36C (90F), when I had ice forming on the guides and everything in the middle. I have many many many casts on the lines. I have yet to see even the slightest bit of damage to them. The one I have on my 15' 10/11 wt. has seen the most abuse by far and it seems to be in as fine shape as the day I got it. I'm not sure how long it takes to wear one out, but if I have not managed to hurt it after the abuse I have put it through, it's going to take a long time. I still have nothing but good things to say about these lines.